Here’s to Franconia Ridge and No Waste! On Friday, I parked at Lafayette Place in Franconia Notch and started hiking up Falling Waters Trail. I passed three types of granite: white, pink, and gray, depending on what combination of feldspar and quartz variations it held. Falling waters made the colors more vivid, especially the pink granite. I was suddenly living in that world McDonough and Braungart wrote about in their book, Cradle-to-Cradle. Their theory is that “in order for humans to prosper, we will have to learn to imitate nature’s highly effective cradle-to-cradle system of nutrient flow and metabolism, in which the very concept of waste does not exist.” The idea is for us to figure out how to live like a tree that completes its life cycle by providing rich soil for new life. Perhaps what draws so many of us to hike in the mountains is that they are a place where the world looks fresh and waste does not exist – a positive boon today. When I began hiking in the Whites, there was plenty of trash on the trails and behind every lean-to. As far back as 30 years ago, as AMC members, we all carried, and filled, a small trash bag to carry out on every hike. Eventually, “leave no trace” and “carry out what you carry in” slogans became a way of life on the trails. Today, whatever rare trash I find usually fits into a pocket. Hiking is truly a way to experience the good life! My plan was to check out the Diapensia on Haystack Mountain and return the way I came. Due to an early spring, the little white 5 petal ground huggers had already left without a blooming trace. But, the sky was so clear we could see mountain ranges around us forever. Maybe there would be a few diapensia blooming higher up if I went over the ridge and down the Bridle Path. The ridge is a leisurely trail running from Haystack, gaining elevation as it rolls north over Mt. Lincoln to Mt. Lafayette. Near Lincoln, I found a few Diapensia stems and spent blossoms and sure enough, just before Lafayette, a small community of sweet blossoms greeted me! Because Diapensia only grows in high mountain areas where they are exposed to all the extremes of weather, people come here from all over the world to see them in June usually. The amazing thing about them is that they can withstand hail, sleet, ice, wind; yet, one carelessly planted heel can wipe out a little patch that took 30 years to grow! There were lots of people on the ridge, including a well chaperoned group of 42 school kids from Quebec and 15 UNH hikers continuing on the Appalachian Trail to Galehead, but at no time did I feel crowded. There was plenty of room for everyone. 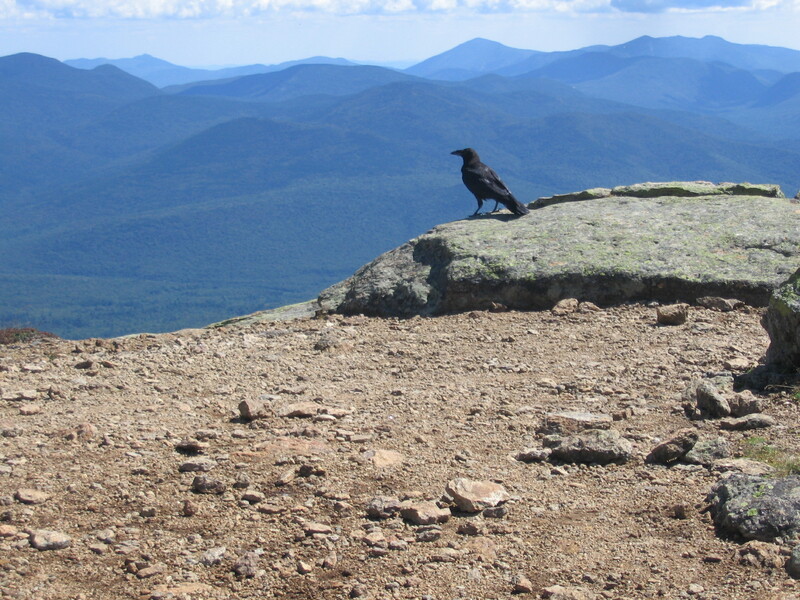 At the summit, I remembered the day my granddaughter and I joined this raven for a long pause to inhale the spectacular view east, including Mt.Washington. Hiking out the Bridal Path from Lafayette, I passed the place that was once an open rock area with a circle of sitting logs where I celebrated finishing the 48 4000 footers with friends 29 years ago. The logs have completed their cycle and are part of the duff that inspired a robust stand of spruce to now claim that space. And my mind raced to what would happen if I didn’t bring anything home that would end up in the wastebasket when no longer useful? There’d be no need for a landfill. What if everything I used could eventually be recycled or laid on the compost so there was no waste, like a tree, that lies down to enrich the ground for generations to come.